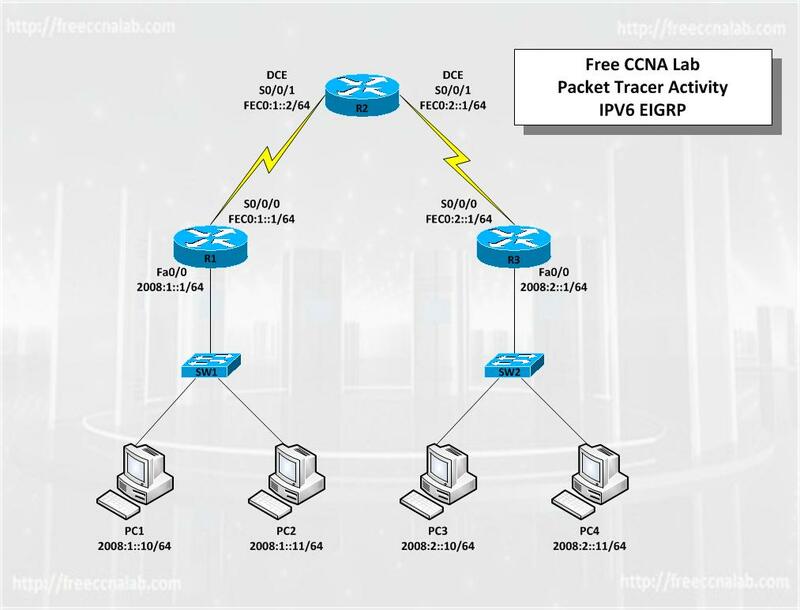 In this Free CCNA Packet Tracer Lab you will configure three routers in a simple IPv6 configuration. Routing will be established using EIGRP. Finally you will use the Show and Ping commands verify and test the configuration and connectivity of the network. EIGRP is an enhanced version of the IGRP developed by Cisco. It is an enhanced distance vector protocol that relies on the Diffused Update Algorithm (DUAL) to calculate the shortest path to a destination within a network. EIGRP for IPv6 works in the same way as EIGRP IPv4 where they can be configured and managed separately. EIGRP for IPv6 is directly configured on the interfaces over which it runs, which allows EIGRP for IPv6 to be configured without the use of a global IPv6 address. Voy a enviar el siguiente comentario para un libre acceso. great labs, but too many review qutiosens when the answers are not there, or online to check yourself. Typically we are adults in this class, answers would only help be sure we are not closing the book with the wrong answer written in, and not knowing.